There were simpler times in Los Angeles, and in police work. Days when there were far fewer reports to complete, fewer notifications to make and still the job was done. Progress, it seems, means more paperwork. We know this, because we have the paperwork, at least some of it. These pages tell us the story of a Christmas Eve 70 years ago. Unfortunately, it connects us to a New Year’s Eve tragedy some 65 years ago. Mario Deiro worked during this simpler time. 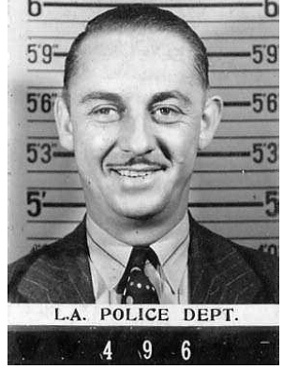 He joined the LAPD in 1934 and by all appearances was an accomplished professional by the time of his death eight years later. 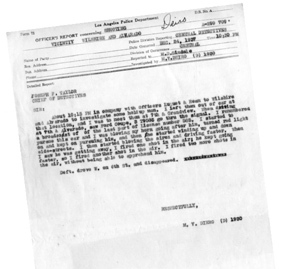 News accounts list some of the cases Deiro worked. He is credited with saving a suicidal nurse. He was a young homicide detective when there were few. He worked headline cases, then unfortunately became one. Some of his reports are on file at the historical society. One of them details the officer-involved shooting he took part in on Christmas Eve 1937. More shots were fired than paragraphs were written. A simpler time, indeed. The holidays, and their eves, have proven deadly for Los Angeles Police Officers. Floyd Eiler was killed on Christmas 1911. W.G. Chamberlain was lost thirty Christmases later. Steve Gajda was killed on New Year’s Day ten years ago. Norbert Huseman left us on New Year’s Eve 1945, just three years after the Deiro tragedy. Mario Deiro, a detective lieutenant, wearing plainclothes stopped to investigate the report of a man down in the gutter. It was the final day of 1942, and he found one, in front of a beer parlor no less. Deiro checked the report and seemingly wrote off the man’s presence to the seasonal revelry associated with ringing in the new year. As he began to drive off, Deiro was engaged by a suspect who claimed that Deiro appeared to be running over the downed citizen. Words were exchanged and a confrontation between Deiro and a small group ensued. Deiro dropped his drawn weapon. As he stooped to recover the handgun, Deiro’s assailant fired multiple times. One of the rounds struck Deiro in the mouth, killing him instantly. A pair of radio car officers heard the shots and pursued the fleeing suspect and his confederates. Three were captured, one of whom admitted to firing the fatal shot. The murder weapon was recoverd from the suspect before his booking at the jail ward. Seems he had bumped his head while entering the police car. While the capture and confession were fairly simple, the trial was a different matter. Deiro’s case was ultimately complicated by the fact that he was in plainclothes. The suspect based his defense on a claim that Deiro, an armed man in a suit, was going to kill him. The jury convicted, but of a lesser offense, manslaughter. Deiro’s is one of two-hundred stories populating a century of sacrifice that is now drawing to a close. The Deiro case is one of five we have shared in this newsletter during the past year. All have been shared in recognition of those who served and perished, and all are shared with the hopes that these holidays are far safer than those gone by. Mario Deiro’s own words about the shooting he was involved in on Christmas Eve, 1937. One of the alluring aspects of law enforcement is the work itself. No two days are the same. There are no groundhog days at the LAPD. The same is true for the historical society. Every day seems to bring about something new. Good things, all of them. Some endeavors help advance the society, some help the department. We do it all with a small dedicated staff and a group of thoughtful volunteers. As we wrap up another prosperous year, it is worth sharing some of the things we have done, and some we plan to do. At the start of the the year, we thought it important to recognize the significance of our losses over the last 100 years. So, in each of the historical society newsletters that had sufficient space we told the story of an officer lost in time. We tried to highlight some of the interesting stories. Some that hadn’t been told, but were certainly worth telling. The same is true with the story of Mario Deiro. We recognize that this has truly been a century of sacrifice. That being said, our board of directors, has vowed to honor the losses by placing a memorial brick at the museum for each and every fallen officer from 1907 to 2007. It is a fitting tribute that should be complete early next year. We have also continued our work to locate and share photographs of those lost in the line of duty. This month we provided sixteen more images of slain officers to the Department for use on their website. As we look to next year, we are busily planning our year. It should be a good one, starting with an event with best-selling novelist James Ellroy. James has volunteered to host a benefit for LAPM. The details remain in the planning stages, but we expect to spend an interesting evening with James in the coming months. Watch the newsletters and website for more information. On May 18th, the historical society will again participate in Museums of the Arroyo Day. This is a great opportunity to visit us and five other local museums. Admission to all of them is free, and so are the shuttle rides between the museums. We had more than one-thousand visitors on MOTA day 2007, hopefully you will see us for MOTA 2008. Also in the mix for the coming months is the creation of a challenge coin for the historical society. Designs are currently being considered, and we expect to have the coin available in early 2008. Again, as we know more about this we will let you know. These are the activities we see keeping us busy well into the new year. In the recent past, we have been busy with even more important endeavors. In early December we assisted the Make-A-Wish foundation with the wishes of a terminally-ill seven year-old. This was a wonderful collaboration that truly revealed the high esteem in which the Department is held. 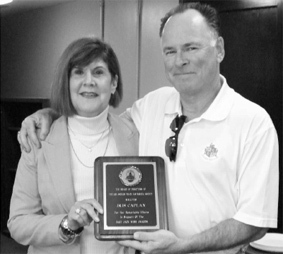 LAPM salutes Iris Caplan for her remarkable efforts in support of the 2007 Jack Webb Awards. We also collaborated with Hollenbeck Area to support Officer Tony Salazar. Tony was intentionally run down by a fleeing narcotics suspect. His injuries are serious, and the society thought it important to support Tony during the holiday season. We did our best imitation of the IN-N-OUT truck when we rolled out the old mobile canteen for a grilled lunch. Our thoughts and wishes are with the Salazar family. The historical society also rolled out for the Highland Park Holiday Parade and the memorial service for retired Commander Homer Broome. Commander Broome was a pioneering figure in the Department’s history. The historical society was proud to be a part of the ceremonies. We extend our condolences to the family. Inasmuch as we have spent a great deal of time providing support in various quarters, we have also taken some time to honor those who support us. We recently held a recognition luncheon for our volunteer cadre. Each has proven to be a true friend of the society, and we thank them. We have also taken a moment to honor some of the people who have assured the success of our Jack Webb Awards. Iris Caplan, Danny Staggs and Keith Bushey were all presented plaques by our Chairman Greg Meyer. Their work was notable, and they are each due our thanks. As the year draws to a close, we are proud to report this was another prosperous year for the historical society. We are confident that we have provided a high level of service, and we have continued to develop and advance the museum. The coming year is full of promise. We hope a visit to the society figures into your plans for 2008. Happy holidays!